This week’s photo prompt is provided by Louise with The Storyteller’s Abode. Thank you, Louise! Bob’s face was turning bright red and there was a very prominent vein in his right temple throbbing. This was partly because he had the worst hangover ever but mostly because the more he tried to tell his fishing buddies about the amazing thing he saw during the night, the more they erupted into fits of giggling. He couldn’t believe this group of teenage girls were his friends. “I’m telling you, I really saw it” He stammered. This is a writing challenge called Flash Fiction for Aspiring Writers. Each week there is a new photo and the writer is to create a story inspired by that picture and no longer than 175 words. This is my submission for the week of 7/25/17. Give you a reason to get out of bed every morning, cause there is no way you are sleeping once they are awake. Wondering what the odd-looking creature in my logo pic is? 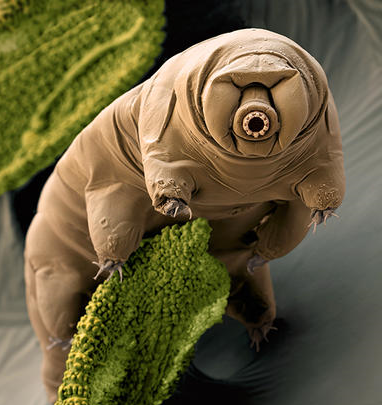 This micro animal is called a tardigrade or water bear. It is very tiny, so small it can live inside of a dew drop. The tartdigrade is a survivor, they have been found everywhere from mountaintops to the deep-sea and from tropical rain forests to the Antarctic. Extreme heat or cold, radiation or even the vacuum of space has not killed them. They can go without food and water for 30 years, only to rehydrate, forage, and reproduce. Fossils of tardigrades have been dated at over 500 million years. I couldn’t ask for a better spirit animal. My first post will be short and sweet cause a seven pound ball of energy is demanding my attention. Who could resist that puppy dog face? Not even big sis.